A size comparison of (L-to-R) the Earth, Wolf 503b and Neptune. The color blue for Wolf 503b is imaginary; nothing is yet known about the atmosphere or surface of the planet. Credit: NASA Goddard/Robert Simmon (Earth), NASA / JPL (Neptune). Wolf 503b, an exoplanet twice the size of Earth, has been discovered by an international team of Canadian, American and German researchers using data from NASA's Kepler Space Telescope. The find is described in a new study whose lead author is Merrin Peterson, an Institute for research on exoplanets (iREx) graduate student who started her master's degree at Université de Montréal (UdeM) in May. The program the team used identifies distinct, periodic dips that appear in the light curve of a star when a planet passes in front of it. In order to better characterize the system Wolf 503b is part of, the astronomers first obtained a spectrum of the host star at the NASA Infrared Telescope Facility. This confirmed the star is an old 'orange dwarf', slightly less luminous than the Sun but about twice as old, and allowed a precise determination of the radius of both the star and its companion. 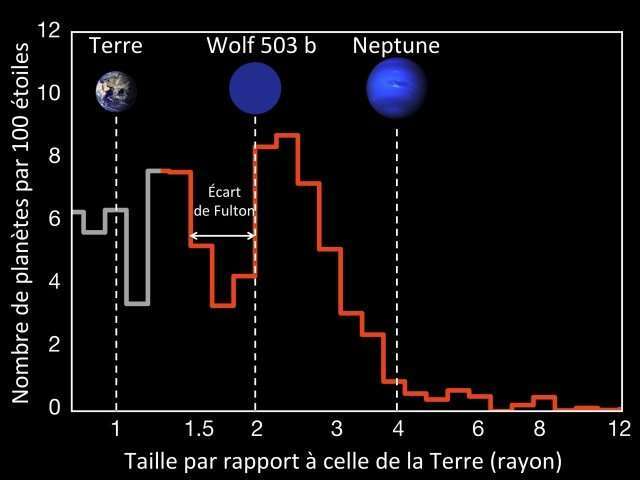 Size of Wolf 503b compared to the distribution of planets found by the Kepler Telescope. Wolf 503b falls just to the right of the ‘Fulton Gap’, a still poorly understood lack of planets between 1.5 and 2 times the radius of the Earth. Credit: B.J. Fulton, using data from NASA Ames, Caltech and University of Hawaii. Wolf 503b is interesting, firstly, because of its size. Thanks to the Kepler telescope, we know that most of the planets in the Milky Way that orbit close to their stars are about as big as Wolf 503b, somewhere between that the size of the Earth and Neptune (which is 4 times bigger than Earth). 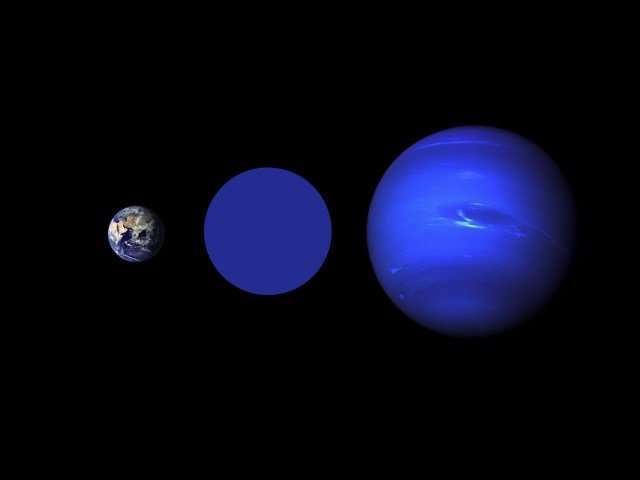 Since there is nothing like them in our solar system, astronomers wonder whether these planets are small and rocky 'super-Earths' or gaseous mini versions of Neptune. One recent discovery also shows that there are significantly fewer planets that are between 1.5 and 2 times the size of Earth than those either smaller or larger than that. This drop, called the Fulton gap, could be what distinguishes the two types of planets from each other, researchers say in their study of the discovery, published in 2017. "Wolf 503b is one of the only planets with a radius near the gap that has a star that is bright enough to be amenable to more detailed study that will better constrain its true nature," explained Björn Benneke, an UdeM professor and member of iREx and CRAQ. "It provides a key opportunity to better understand the origin of this radius gap as well as the nature of the intriguing populations of 'super-Earths' and 'sub-Neptunes' as a whole." The second reason for interest in the Wolf 503b system is that the star is relatively close to Earth, and thus very bright. One of the possible follow-up studies for bright stars is the measurement of their radial velocity to determine the mass of the planets in orbit around them. A more massive planet will have a greater gravitational influence on its star, and the variation in line-of-sight velocity of the star over time will be greater. The mass, together with the radius determined by Kepler's observations, gives the bulk density of the planet, which in turn tells us something about its composition. For example, at its radius, if the planet has a composition similar to Earth, it would have to be about 14 times its mass. If, like Neptune, it has an atmosphere rich in gas or volatiles, it would be approximately half as massive. Because of its brightness, Wolf 503 will also be a prime target for the upcoming James Webb Space Telescope. Using a technique called transit spectroscopy, it will be possible to study the chemical content of the planet's atmosphere, and to detect the presence of molecules like hydrogen and water. This is crucial to verify if it is similar to that of the Earth, Neptune or completely different from the atmospheres of planets in our solar system. Similar observations can't be made of most planets found by Kepler, because their host stars are usually much fainter. As a result, the bulk densities and atmospheric compositions of most exoplanets are still unknown. "By investigating the nature of Wolf 503b, we'll understand more about the structure of planets near the radius gap and more generally about the diversity of exoplanets present in our galaxy," said Peterson. "I look forward to learning more about it."